In a nation famed for its reclusive reefs, the Maldives’ single-island resort concept has produced more than 100 little pieces of paradise for the ultimate tropical getaway. 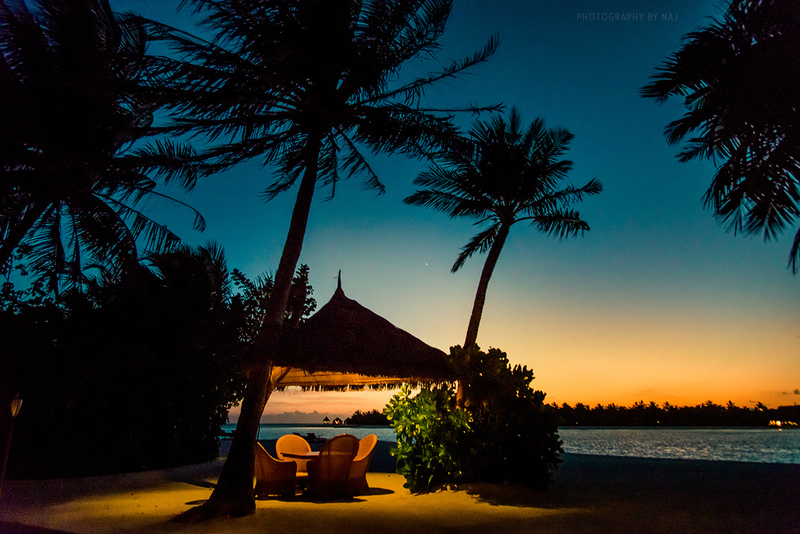 In this sense, Anantara’s slice of South Male’ atoll is no different, offering the romance, the tranquility and the adventure of a Maldivian holiday in equal measure. However, at Anantara’s resorts just south of the capital, these qualities are spread across three different resorts, creating a unique neighbourhood of luxury; Greater Anantara. Upon arrival at the airport, would-be Anantareans are taken to the resort’s airport lounge, before migrating south, past Male’ on the 35 minute trip to the cluster of islands they will make their home. Six islands, spread over 2.7km of coral on the eastern side of the atoll, provide options for families, couples and everyone inbetween. 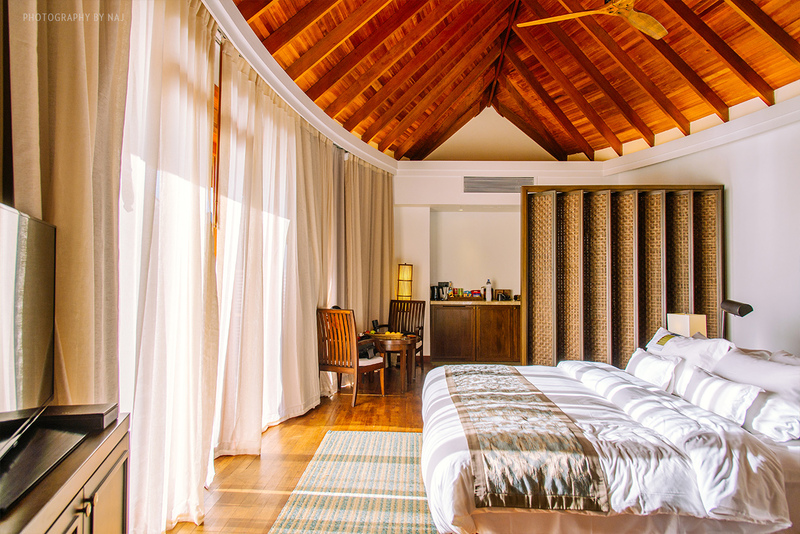 Dhigu – the largest of the three – features 110 family-sized beach villas and overwater suites; Veli, a few moments away caters to couples, with a range of rooms made for two; and Naladhu – the smallest of the three – offers around 20 ‘houses’ for those who really want to get comfortable. Two ‘picnic islands’ – one with it’s own cafe for hungry snorkellers – as well as a staff island, complete the complex. 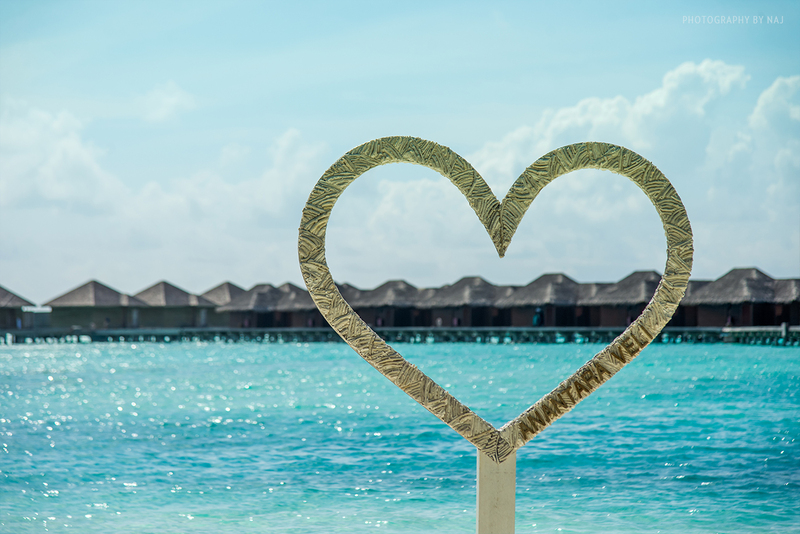 Dhigu is without doubt the heart of this coral community, housing four restaurants, the Aquafanatics water sports centre and the largest of the complex’s three spas. It’s recently renovated water villas are particularly spacious, assisted by cavernous ceilings designed to resemble an upturned dhoni. Sprouting northwards from the tip of the island, the water villas’ wall to wall windows frame spectacular sunsets and sunrises. Similarly, the island’s dining options serve up early morning sun at the Fushi Cafe, or residents can drink in the sunset at the poolside Aqua Bar on the opposite side of the island. The Sea, Fire, Salt restaurant goes a little further west, bringing spectacular surf and turf over the reef, with ‘Salt Gurus’ on hand to change the way you feel about seasoning. Upstairs, those wishing to journey still further west can take in Italian cuisine at Terrazzo. Dhigu dwellers looking for a new place to eat can use Greater Anantara’s transport service to Veli, taking a bicycle to the south of the island before hopping onto the cushioned ferry between the islands. Lazy hammocks and love hearts emerge from behind the tiny Moyo Island sandwiched in between, as do more of the island’s intimate water villas. Veli is Greater Anantara’s adults-only area, bringing ocean calm up the beach and into the island. Breakfast and dinner buffets at the pavilion-style 73 degrees restaurant can be interspersed with poolside snacks at the Dhoni Bar, while Origami brings Japanese cuisine into the fold. 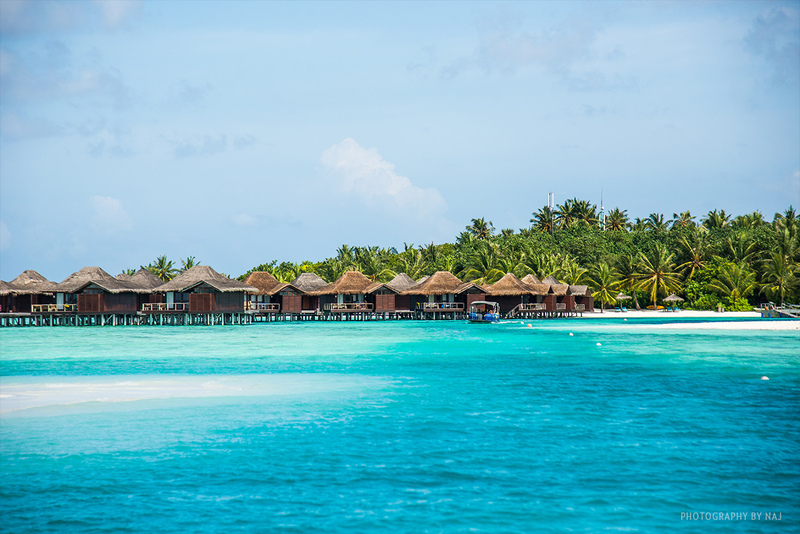 As with Dhigu, the Veli suburb offers a range of activities, including cooking classes, watersports, and morning meditation and Yoga to kick-start a hard day’s relaxation. Invitation only cocktails at the Orchid garden add further to the refined air of Veli, with countless Mr and Mrs’ having left their mark via wooden hearts decorating the area. Lying on a long jetty between Veli and Naladhu is the Baan Huraa restaurant – claimed to be arguably the finest Thai restaurant in the Maldives. 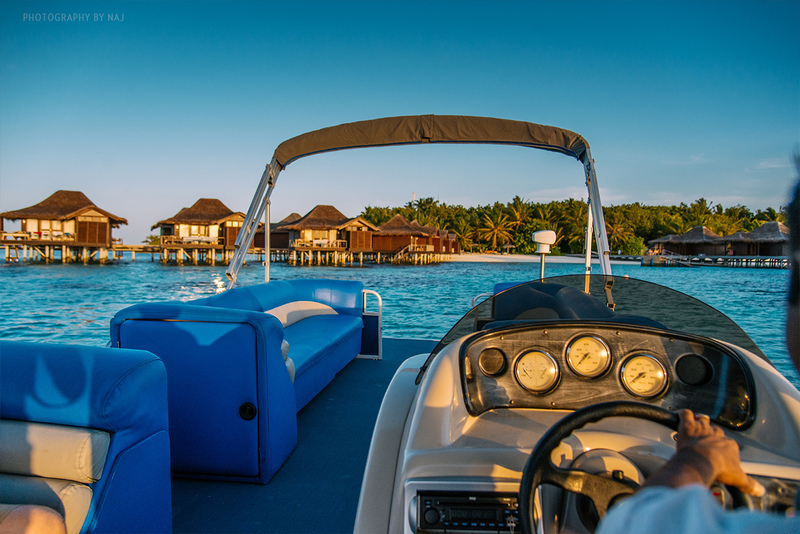 Naladhu itself is the smallest and the most-exclusive district in the Greater Anantara constellation. 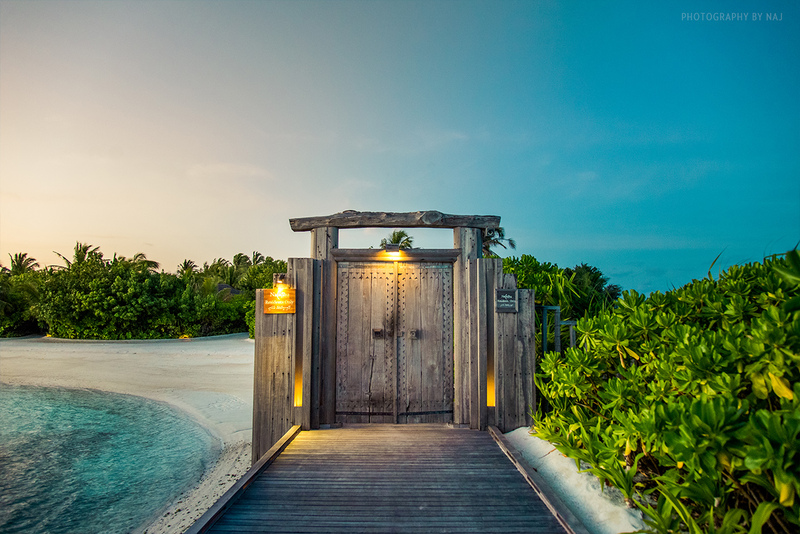 A large wooden door at the end of the long bridge from Veli is more Dungeons and Dragons than Sun and Surf, bringing an air of mystery to what is essentially a private, gated community. This island is accessible only to residents, and no amount of riddles solved or duels won will gain you entry to this tranquil realm (residents have a key, while other Anantareans can book ahead for dinner on the island). Twenty ‘houses’ – all named after local flora – are nestled along a weaving maze of sandy paths. Inside, a mixture of world styles furnish the apartments, making even the farthest flung traveller feel at home. Bookshelves are customised to the guests before their arrival and room service is available – 24/7 – at the touch of a button, leaving no impediment to the suburb’s glorious privacy. Enormous outdoor decking areas provide cinematic views from the outdoor bathroom, which leads into the generous pool. The theme continues in the aptly named Living Room, where guests can live another Indian Ocean sunset as they enjoy a bottle from the restaurant’s impressive cellar – one of three in the community’s $500,000 wine treasury. Whichever resort you choose to stay in, this tropical trio – Dhigu, Veli, and Naladhu – together provide a wide range of options to make your trip to Greater Anantara greater.